It was a moonless night, even the stars had covered themselves with a blanket of fluffy white candy floss like cottony clouds. The melancholy of the night was broken by the whispering winds and the tapping of my feet as I walked alone on the winding streets of Jebel Haffet mountains. The Jebel Haffet mountains looms over the hamlet of Al Alain in the Emirate of Abu Dhabhi and is approximately 165 Kms from Dubai. We had taken a weekend break and had driven down earlier in the day. We reached the Hotel Mercure Grand as the sun was setting, with little D sleeping blissfully in the backseat of the car. Though she was overtly excited about this trip, somewhere in the midway during the drive, she had fallen fast asleep. We decided to let her complete her siesta while we unpacked and got ready to unwind. But a business call soon after, got Mr. S busy and I felt a little restless sitting in the room staring at the TV sometimes and sometimes at the ceiling. So I walked out to the balcony and stood there for a while. The mountains were quiet and dark and I could see the city of Al Alain sparking brightly on the foothills just like a diamond necklace bejewelled around a maidens petite neck. I felt drawn to this beautiful view and wanted to have more of it. Little D would not wake up so soon and Mr. S would be busy with his work for sometime now and so I thought it would be a good idea if I took a walk and got some breeze in my face. It was dark and still as I ventured out of the hotel, even the wind was passing by as if at will, occasionally. I walked lost in my thoughts on the completely empty streets away from the hotel and up the mountains. We had reserved all the walking and adventures for the next two days but here I was hitch hiking aimlessly all by myself . The eerie silence did bother me in the beginning, but as soon as the winding way led up and the mountains cleared the view of a huge brightly lit mansion atop, further up, I began walking eagerly towards it. My curiosity got the better of me and I felt I guess like Nancy Drew, remember the dainty sleuth from the mystery series book by Carolyn Keene which many us would be glued to way back in school. I don't know what mystery I was out to unravel and I was clueless why I was been drawn to the mansion. Yes I could hear faint strands of music, I could hear far away voices chattering away, the clinking of cutlery and I was walking without a heed towards the mansion. In my eagerness to reach that house, I completely became oblivious to the fact that this was a motorable road and there would be vehicles plying on that road. I was just some steps away from the gates of the mansion now, had to take a turn and there I would be. Suddenly a delivery van appeared and was speeding towards me out of that sharp curve which led to the gates of the mansion. Blinded by its light and petrified of what would happen next, I froze on that very spot. In a fraction of a second the vehicle would be over me and just as I stood there watching in a daze, somebody gripped my hand firmly and with the most powerful jerk ever, pulled me off the road. In that strong pull, I tumbled to the side of the road and could barely pull myself up with the shock of the entire incident as the delivery truck faded away leaving the place dark again. I must have been there for a few seconds trying to sit up when a hand was extended up to me. I looked up and saw a lady clad in an Abaya, the robe like attire worn by women in this part of the world. As I steadied myself onto my feet, I saw her beautiful doe eyes through the niqab on her face. I really didn't know what I wanted to do. Maybe go down on my knees and thank her for giving me a new lease of life. She was still holding my hand and I clasped her hand now with both my hands, as tears streamed down my cheeks, all I managed to say to her was SHUKRAN, THANK YOU. Surely thank you was too fragile that evening in front of her deed, but I had put all my heart and soul in that word when I had said it to her. She turned around and started walking away from me. I stood there watching her and thinking to myself that I had, had a glimpse of an angel, who had sprung out of nowhere and saved my life. Later when Mr. S and little D came to pick me up from there I was only thanking my fairy for gifting me back these precious moments with my loved ones. That incident taught me to be grateful every moment and count my blessings more frequently. Thank you dear readers for bringing me multitudes of smiles always. 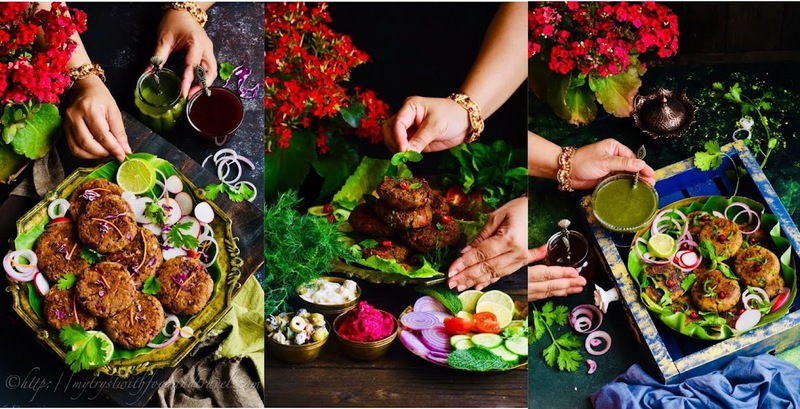 It's Blog Hop time again friends and the Culinary Hoppers decided it would be Biryani or Kebab or both that we would put up this time. I chose kebab and will be sharing with you MALAI SABZ SEEKH KEBAB. 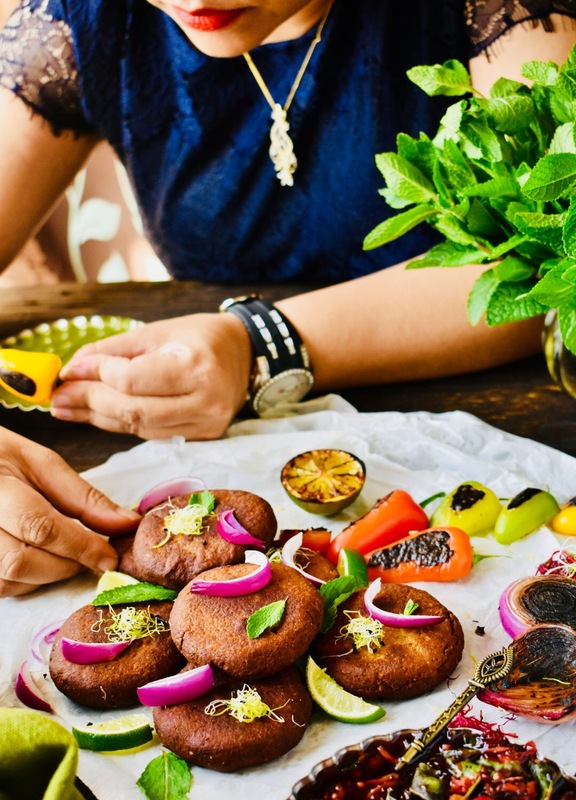 This is a VEGGIE (SUBZ) KEBAB wherein dollops of MALAI ( CREAM) is used to prepare the base mixture. As I am always looking out for healthy options, I replaced the cream with low fat Hung YOGURT. This retains the original taste without adding oodles of calories to the kebab. 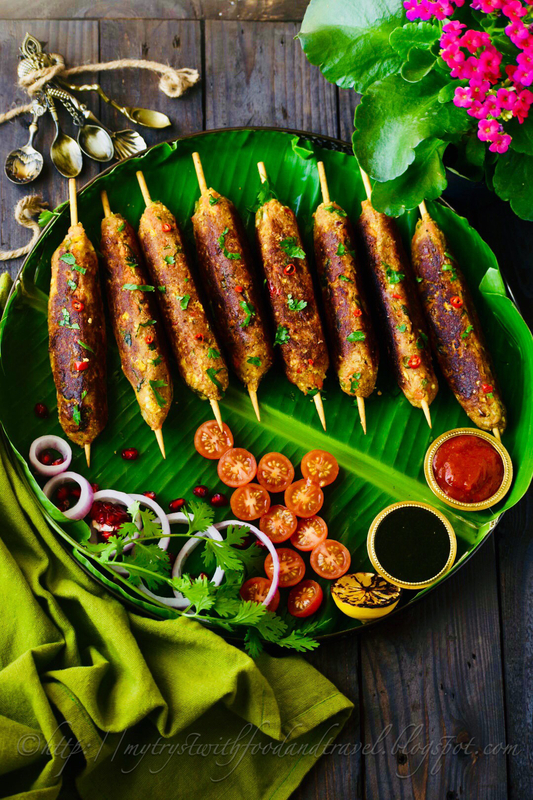 Finally the Kebab mixture was skewered on wooden skewers ( SEEKH ) and grilled. Traditionally SEEKH KEBABS are cooked in a Tandoor, or on top of a grill with red hot embers beneath. I grilled my veggie kebabs in a grill pan. 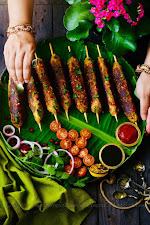 So let's get making MALAI SUBZ SEEKH KEBAB and don't forget to check the decadent dishes of the other supremely crafted bloggers of the Culinary Hoppers team right at bottom of this post. 1) Chop carrot, baby corn, beans, red bell pepper, onions, ginger, garlic, coriander leaves and mint leaves finely. Boil and skin the potatoes. Crush the raw almonds coarsely. 2) In a non-stick pan saute, carrot, beans & babycorn without oil till soft. 3) In a large mixing bowl add boiled potatoes, cottage cheese, red bell peppers, chopped onion, garlic, ginger, mint leaves, coriander leaves, red chilli powder, chaat masala, garam masala, gram flour, salt and use your all important fingers and mix together nicely. 4) Next add the hung yogurt and mix well. 5) Now add the sauteed veggies and again mix well. Finally add the crushed almonds and bread crumbs and mix everything together to form a mixture of soft dough like texture. TIP:You can add more bread crumbs to get the perfect texture. 6) Divide the mixture into 10 equal parts. Wet your palms and skewer the mixture onto the wooden skewers(seekh). Repeat the process with all the 10 parts of the mixture. 7) Heat a grill/tandoor etc. and grill/tandoor the MALAI SABZ KEBABS till they get a nice golden colour all over. Serve hot with chutneys of your choice. I have served with a mint chutney and a fiery tomato salsa. Serve hot with chutneys of your choice. I have served with a MINT AND CORIANDER CHUTNEY and a fiery tomato salsa. LINKS OF SUPERLATIVE BIRYANI AND KEBAB RECIPES FROM THE BLOGGERS OF CULINARY HOPPERS ARE GIVEN BELOW. 1) SHAHI KORMA BIRYANI BY ANU NAGARAJA OF EASY BITES ONLINE.